A self-proclaimed “Wise Guy,” fantasy fiction author and anthology editor. JMW: Hello, this is Jean Marie Ward for BuzzyMag.com. 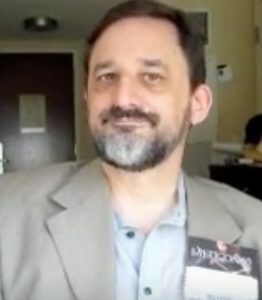 With me today is Michael A. Ventrella, author, editor, LARPer, animation expert, and occasional lawyer. Welcome, Michael. Michael A. Ventrella: Hello, Jean. JMW: Your 2014 novel, “Blood Suckers ,” about a vampire making a run for the White House, seemed pretty far-fetched when it was released. Now Donald Trump is the Republican nominee. Do you have a crystal ball I should know about? Michael A. Ventrella: Well, not quite. Here’s the distinction that I don’t think people understand. When they hear a vampire is running for president, they think he’s the bad guy. I thought that was too easy. So in my book, the vampire is the good guy. He is someone who uses his vampire powers to make things better. He believes he’s going to make the world a better place. He’s a very liberal Democrat. He’s not the bad guy, in that sense. I didn’t want it to be too easy and too obvious. The main character’s a reporter who really likes this candidate and supports him. The candidate is sort of like Bernie Sanders, but younger and handsomer. JMW: Permanently younger and handsomer. Michael A. Ventrella: Permanently yes. And so he’s really supporting this candidate and all the crazy right-wingers are saying, “Oh, this guy’s a socialist,” and, “He wasn’t born in America,” and, “Not only that, he’s a vampire.” And they’re right about all that stuff but nobody believes them because vampires don’t exist. So what happens is Steve, that’s the main character who’s a reporter who’s really supporting this guy, ends up as a suspect in the attempted assassination of this candidate and he has to go into hiding. And he’s being chased by the vampires, he’s being chased by the FBI, and the only way he’s gonna be able to prove his innocence is to prove that vampires exist and who’s going to believe him? He then has this moral dilemma. Because on one hand, he knows this guy’s a vampire who kills people who gets in his way. On the other hand, he thinks that the other candidate is worse. So I wanted that kind of moral dilemma where, are the ends justified by the means? If we have this vampire president, is he going to be better for the country or do we say, “No, we can’t have a vampire. Are you kidding? He’s evil. He’s terrible.” I don’t want black and white. I want grey areas, you know? JMW: And then there is the whole term limits thing. A young hero struggles to overcome his inexperience and limitations to figure out the meaning of the mysterious prophecy. 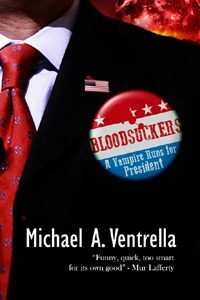 Michael A. Ventrella: Well, he certainly doesn’t say he’s a vampire, but of course once he gets into office, if there was ever a sequel, we could start addressing whether he gets rid of that term limit part or not. That can happen in the sequel. One of the funny things, if you talk about prophecy, is that in the book, he who is the democratic socialist candidate has this big rally in New York one point and as a joke, I put in that his opening band is Vampire Weekend, which was is a real band, of course. About three months ago, Bernie Sanders had this huge rally in New York and guess who the opening band was? Michael A. Ventrella: Yes, I’m predicting the future and then I do the whole Hodor, Hodor thing. Michael A. Ventrella: Exactly. And I was just making a joke. Anyway. JMW: Well, speaking of jokes because politics is kind of…Conventional wisdom says writers and other public figures should not discuss politics. You don’t. You discuss it. How do you make it work for you without, you know, people coming after you with the pitchforks and the stakes? This book was a result of a kickstarter campaign to raise money for C.J. Henderson who needed money for medical bills, as he was fighting cancer at the time. All proceeds from this will go to his widow, so it’s not only a great collection of stories, it’s also a great cause. Michael A. Ventrella: Well, the good thing about writing about politics is that it gets me a lot of attention. My political blog gets more hits than my writing blog. And hopefully if they read that, they’ll say…if they like how I’m writing my political blog, they will then go to my books and hopefully like them as well. But I just want to be myself. I don’t care about putting forward an image. This is who I am and I’m not one of those people who likes to have a fake image for my books that’s separate from who I really am as a person. My degree is in political science, I obviously have a law degree on top of that, and I like talking about politics. I’ve worked on many campaigns. I was a lobbyist for a while and I know how politics works. JMW: Oh, you were one of the bloodsuckers. Michael A. Ventrella: I was one of the bloodsuckers. I was a lobbyist for a liberal group in Massachusetts called Americans For Democratic Action. I helped get the first gay rights bill passed in Massachusetts back in the ’80s and worked on equality in insurance back in those days when that was a big issue. Those are my two biggest issues I worked on when I was a lobbyist. JMW: Still big issues today, seriously. But vampire politics and traditional fantasy novels aren’t the only things you’ve got going for you. Because you do write traditional fantasy and if you’d like, maybe we should talk about that a little bit here. 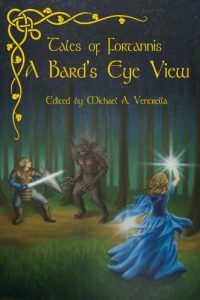 Michael A. Ventrella: Well, years ago back in the late ’80s, my wife and I started a live-action role-playing group and this was back when it was something brand new. We had no idea what we were doing. We were throwing it together. The word LARP hadn’t even been invented yet. And so for many years, I wrote for that LARP. I wrote the background, I wrote the histories, I wrote plot lines, I did all that kind of stuff. And so that helped get my writing skill improved quite a bit. So after a while, I said, “I wanna write a novel,” and I put the novel in the world of that game because the world had already been defined so broadly. I made sure to ignore the rules completely when I was writing the book because I don’t want people to feel like they’re reading a transcription of a game. And it’s not. It’s completely…people who read it don’t know it’s based on a game. So pretty much I used the world, ignoring the rules completely because it makes it feel real, you know. I’ve had two novels in that series so far. A third one comes out this summer. It’s called “It’s a Wonderful Death.” And it was written with Derek Beebe, who basically said, “I wanna write a book in your world.” I went, “Okay.” So he wrote a book and then I rewrote it and he rewrote it and I rewrote it and we were basically working together. And it’s going to be out in a few months. JMW: That sounds fun. 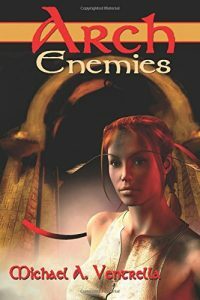 I love collaborative novels because you can feel…in most cases, if you like working together, you can feel the joy that goes into the interplay between two people. Includes stories by noted authors Davey Beauchamp, Danny Birt, Nick Bond, Jon Cory, Roy C. Booth and Brian Woods, Tera Fulbright, Laurel Anne Hill, Ron F. Leota, Mark Mensch, Bernie Mojzes, Matthew C. Plourde, J. Thomas Ross, and Mike Strauss. Michael A. Ventrella: He has the same kind of sense of humor I have. Because all my books have a bit of sense of humor. You shouldn’t take them too seriously. I mean, people die. Bad things happen. But there’s a bit of a snarkiness in them sometimes and a bit of fun. And he has that same sort of love of good dialogue that I have and so we get along well that way. JMW: Oh, that’s great. But to carry it further, you know, it’s not just the traditional fantasies, it’s not just bloodsuckers. But you’ve also recently edited a rather interesting Sherlock Holmes anthology? JMW: Could you tell us a bit about that. Michael A. Ventrella: A while ago, I wrote a story, a Sherlock Holmes story that took place in the future with a female Sherlock Holmes. And I really liked it and I said, “You know, this could be a good series.” And I started asking other authors if they wanted to contribute to it and the next thing you know, I got an agent who said, “I want to represent this.” And so the book is going to be coming out in January. We’re doing an audio version as well. It’s gonna be on Diversion Books. We’ve got Jonathan Maberry. I’ve got David Gerrold. I’ve got Jody Lynn Nye. I’ve got Gail Martin. I’ve got Hildy Silverman. I’ve got a whole bunch of really big names and people who I’ve always admired are contributing to this and I’m so happy about it. It should be pretty good. 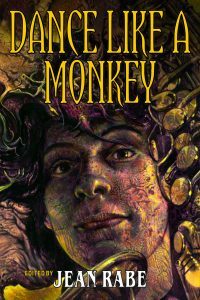 Anthology from editor Janet Morris. Michael A. Ventrella: …anthology…is that I was able to be so picky. I hate to be cruel to many of those people who wrote. I had some wonderful stories that just couldn’t make the cut. And it’s always happiest when you’re an editor and you can pick the cream of the crop. In other words, the stories I rejected are still good enough to be published, but these other ones were better. It’s a nice feeling . JMW: Not only that, it’s a nice feeling for the readers because they’re getting the cream of the crop. JMW: With all this going on in your day job, because you are an occasional lawyer or more than occasional lawyer, how did you get sucked into staging “The Eye of Argon ” at fantasy and science fiction conventions? And as they were reading it, I was acting out the story, being the ham I am, and I just got so many laughs and people liked it so much that I went to other conventions and said, “Hey, would you like to do this?” Pretty soon I had a pretty good troupe of hams who would join with me and the audience would go along. So it mostly just sort of grew out of that. I offered it to the conventions and they said yes. At MystiCon recently, Peter Prellwitz was there with us and he actually made a good presentation, like a PowerPoint presentation, so we had the script behind us. So everyone in the audience could read along and that was wonderful. If I could do that every time, I could. 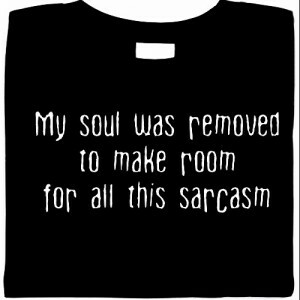 Unfortunately I don’t have that here. We’re going to do it tomorrow night at Balticon but I don’t have a PowerPoint presentation. JMW: But it’s gonna be hysterical. It always is. Michael A. Ventrella: It always is. JMW: Yeah. What are you working on now? 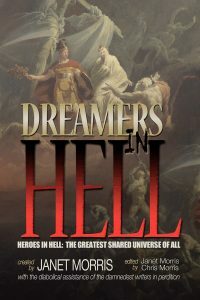 Michael A. Ventrella: Well, besides “It’s a Wonderful Death” and the Sherlock book, I’ve got a fourth book in that anthology, the fantasy anthology . That’ll come out probably around November. But what I’m trying to write, when I have any time…and that’s the problem is, you know, these other things have deadlines…is a steampunk novel featuring Teddy Roosevelt. And I’m having so much fun. My main character is like the Watson to his Sherlock, so it’s sort of told from the point of view of the secondary character. Michael A. Ventrella: And Teddy is just such a colorful character. I’m having so much fun with, you know, he meets Mark Twain and Harriet Tubman and I’m putting so many famous people in this and I’m just enjoying it and Teddy just takes it away. I mean, I had a scene one time where my main character is out doing some spying and she’s sneaking around, she’s looking over to the corner, and Teddy just suddenly burst into the into the room and sort of took over and said, “Ah, I’m here to save the day,” and I’m writing this going, “I didn’t plan that.” Teddy just sort of took it over because that’s what he would do. JMW: Yes, that is exactly what he would do. Michael A. Ventrella: And I’m loving it. I just wish I had more time to finish it. JMW: Oh, it sounds wonderful. Can’t wait to read it. Okay, we’re coming up to the end of the interview. Is there anything you’d like to add? Michael A. Ventrella: Please go to my webpage at MichaelAVentrella.com and say hi. JMW: Great. Well, thank you, Michael. And thank you for BuzzyMag.com.